Expert installation is the key to a great looking exterior of a home. Our experienced crews know this and work to make every home look as great as it can. At National Home Improvement, Inc. we treat each installation as though it were being done on our own home. You can expect quality products and expert workmanship on every project we take on. There are a number of siding options available for your home, make sure to choose a siding that will fit your priorities the best. If you need help making the decision, we will leverage out experience to help you make the best decision for your home’s function and appearance. Below are the most common siding material options. Please know that there are also many styles to help further customize your choice. As for any ongoing maintenance, wood siding needs to be painted to be weather proofed. If it is not painted, wood siding will succumb to the negative effects caused by moisture related issues. If you need to clean your siding for any reason, pre-treat with bleach or a vinegar based solution, then wash with a mild soap or detergent. If you have any significant stains, these can be removed with a light sanding. Follow up with a coat of paint if necessary. Lastly, since wood siding is lumber, it can easily be recycled which makes wood siding a great choice when “going green”. 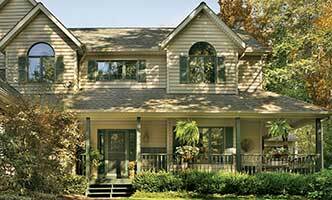 Vinyl siding is one of the most widely available and affordable home siding options. 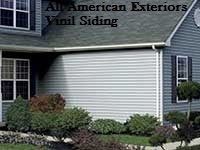 The durability of vinyl siding makes it a great long term, economical choice. Many vinyl siding brands even come with lifetime warranties. A few disadvantages about choosing vinyl siding is that when it is damaged, which doesn’t often happen because of its durability, the entire section of the vinyl needs to be replaced unlike other siding choices. Also, and unfortunately, vinyl siding is much more limited in color because you are not supposed to paint vinyl siding. These are only minor draw backs, however, and for many people the benefits far out weight the minor disadvantages. When considering the maintenance of vinyl siding, it is easily cleaned with some soap and water, but pressure washing is discouraged. Going Green: Vinyl siding has become very popular because it is made out of recycled products. This is the “green” choice if you are looking for home siding. Over the years, steel siding has become a great alternative to wood siding. It is very low maintenance and comes in a broad range of styles and textures. Steel siding has become more popular over the years on newer homes. But even though it has grown in popularity, there are a few considerations when choosing steel siding. Some of the pre-finished steel siding has been known to fade or wear over time. Because of this, they also offer vinyl coated steel siding in a variety of colors. One of the minor draw backs with steel siding is that it can be dented. It’s greatest benefit is that it is low maintenance, in fact it is so low maintenance that the vinyl coated siding normally comes with a 35 year warranty. As we know it today, fiber cement, or strand siding, was developed in the 1980′s by James Hardie which is why it is also commonly known as “Hardie Board”. We utilize both Hardie Board and LP Smart Strand, and both are a combination of cellulose, cement and sand that is produced in many different styles. The durability of fiber cement siding is incredible. Most warranties on strand siding are for 15 years on the finish and 50 years on the siding itself. In addition to the durable nature of fiber cement, it can also easily mimic other sidings for a more traditional look including wood siding and even stucco. Fiber cement strand siding comes in many colors and is known to hold paint pretty well if you ever wanted to change your home’s color. Being noncombustible, very water resistant, and not susceptible to termites makes strand siding a wonderful choice for your home. The installation tends to be more difficult because of the weight of the siding, but it is otherwise maintenance free; only requiring a painting every 15-20 years. Strand siding also uses 10%-20% recycled materials. Stucco siding makes for an incredibly durable exterior. In most instances where we install stucco, there is also an addition of foam board insulation which helps to increase energy efficiency. Stucco can be applied in a vast array of colors in order to fit your exterior perfectly. 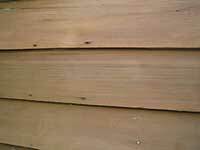 Wood Siding is a lightweight and easy to install solution to home siding. Wood siding can come either already painted or pre-primed and awaiting the perfect coat of paint for your home. With advances in technology, LP SmartSide has become very popular alternative to wood siding. Giving the look of traditional wood siding but with the work ability and protection of engineered wood products. LP SmartSide protect against fungal decay and termites with greater strength and protection than traditional wood. Using wood siding makes your home more customizeable in terms of color. Many of the other siding options don’t allow, or discourage homeowners from painting it. Wood does not have any of those limitations. Over the years, wood siding has become more refined and is now more resistant to insect damage, and also uses less lumber to accomplish the same function. Lap Siding – This is the most popular siding in the US. 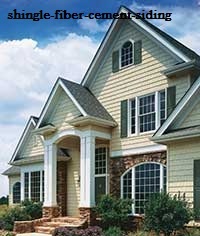 Most commonly characterized being horizontal facing siding that looks as if it is stacked or “lapped” onto itself. There are many different customizable options that make this siding easily fit your home’s aesthetics. Board and Batten Siding – A very traditional look for a home, these are vertical facing panels that wrap the home. Board and Batten was designed to mimic the look of traditional buildings and barns that used battens to fill the gaps or seams that were created between each vertical board. Shingle Siding – This is siding that is also frequently called “shake siding”. They are typically available in vinyl, wood, fiber and cement, and are customizable through size shape and color. We have been proud to serve the residents of Las Vegas and its surrounding communities for over 12 years. We hope to keep up our strong record of successful siding installations with your home. Why Choose us as a Contractor for Your Siding Needs? Our emphasis over the years has been on continually bettering the service we provide, and it has served us well. We have hundreds of clients that would agree with us.